Lucifer and John Decker are trying to make sense of each of their worlds. One is trapped in a dimension of confusion, while the other faces the dilemma of grief. As they both try to find their way out of their circumstances, they each face turns that they didn’t expect, leading to new problems in their respective worlds. This story is… a lot. And that’s pretty cool. 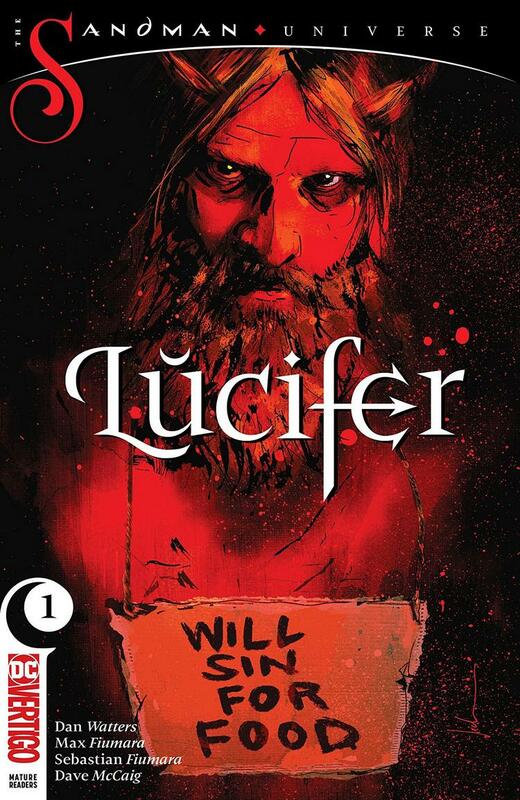 Lucifer #1 takes us through two journeys. One supernatural, the other (relatively) ordinary. Both Lucifer and John are trying to escape some facet of their realities, and in some ways they are both trapped by grief and pain. There is no telling what’s in store from this point, as the end of the issue is just as jarring and confusing as the events that transpired before. However, that only leaves me intrigued about how these stories truly connect. Dan Watters has an uncanny ability to bring seemingly disparate worlds together. With John’s experience toward the end of the issue, you can start to see how his and Lucifer’s world may come together. Watters capitalizes on strong emotions throughout the issue to bring us closer to understanding each character’s plight. Max and Sebastian Fiumara create some truly frightening imagery. And it works. The twisted and distorted pictures hone in on the otherworldly feel of this comic. Every character seems desolate and diminished, whether in their emotions or their physical appearance. The aesthetics of this comic lend to the clamoring for escape that each of the characters exhibit. It’s hard not to feel sorry for each of them, and the Fiumaras skillfully express this through their art. Dave McCaig’s colors feel like an emotional snare. There is very little brilliance through the issue; most of the colors are muted. Even though you can catch a distinction between cool and warm schemes, they still feel as though they are deeply steeped in pain and strife. McCaig infuses a sense of dread, sorrow, and agony into each panel, a perfect match for the tone of the story. Steve Wands’ letters help to capture the true tone of each of the characters. With the distinction in speech, it’s easy to feel the different places characters land. Some are ominous, while others feel ordinary, an important discrepancy that lends to the various people in the story. There are so many voices to capture, and Wands represents each of them through letters. As I said, Lucifer#1 is a lot. Digesting the story, the ideas, present in the comic is no small feat, and it leaves us reeling from the events and curious as to what happens next. I am excited to see how these story threads intertwine, how John and Lucifer may be parallels to each other. Using the narrative set forth by this creative team, we get to see how as humans or paranormal beings, we may still have similar experiences. Dense and macabre, this comic seems to have a lot in store for the future.